Cape Town, noted for its harbour and beautiful natural setting, is the second most populated city in South Africa. It is the Western Cape’s provincial capital and South Africa’s legislative capital as the seat of the National Parliament. It has also been one of the most heavily touristed destinations in South Africa since the post-apartheid 1990s. The centre of Cape Town is situated at the northern tip of the Cape Peninsula, on the shores of Table Bay, with Table Mountain forming a dramatic background. 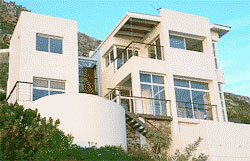 It is also surrounded by the cliffs of the Devil’s Peak and Lion’s Head mountains. Many of its suburbs are in the Cape Flats, an immense sandy plain joining it to the mainland. The Peninsula enjoys a pleasant Mediterranean climate. Winters (from May to September) are usually cool, characterized with large cold fronts coming from across the Alantic Ocean, strong north-westerly winds, and heavy rainfall. Summers (from November to March) are relatively warm and dry, with mild temperatures. The only time when the heat becomes uncomfortable is when the Berg Wind, a mountain wind blowing from the Karoo area, sweeps across the peninsula for a couple of weeks in February or March. Cape Town has a long history, beginning in the mid-17th century when the area by the shore of Table Bay was developed by the Dutch East India Company as a supply station for Dutch ships bound for Eastern Africa, India and the Far East. On April 6, 1652, Jan van Riebeck and other Company employees came to the area and established the first permanent European settlement in the country. The settlement soon became the Cape Colony’s thriving economic and cultural centre. Cape Town prospered and was the biggest city in South Africa until Johannesburg took its place after the Witwatersrand Gold Rush in the 1880s. Cape Town was not spared from the atrocities of Apartheid, and widespread segregation was enforced in its formerly multi-racial suburbs. Many black African residents were forced out of their homes and relocated to the Cape Flats and Lavender Hill, where they lived in poor conditions. Cape Town was also home to many anti-apartheid leaders, and the Cape Town City Hall gained fame as the location of Nelson Mandela’s speech upon his release from prison on February 11, 1990. The event marked the birth of a new era; four years later, apartheid was abolished. Cape Town’s beautiful scenery and diverse culture attracted the attention of world travelers, and soon it became a popular travel destination. Real estate and tourism industries have since boomed exponentially, though the city has struggled with the problems of HIV/AIDS and tuberculosis, drug-related crimes, and some recent xenophobic attacks. Today Cape Town is the Western Cape’s economic hub, and a major manufacturing centre. It has seen a steady growth in revenue and industries related to government services. It is a venue for many international conferences. Since the country has been selected as the host of the 2010 FIFA World Cup, construction and real estate market is flourishing in prime locations like Cape Town, attracting summer home buyers and more permanent migrants. And there are many homes to choose from. Small, distinctive, H-shaped Cape Dutch homes, well-preserved Edwardian and Victorian buildings and modern high-rises create a rather elegant cityscape. Not far are posh malls, antique shops, craft stores, specialist boutiques, flea markets, and art galleries. Lovers of wine and good food could satisfy their appetites with the many restaurants offering a variety of cuisine and vineyards producing some of the world’s finest wines. The business district is also undergoing an extensive urban renewal plan. There are many specific zones within the city. The City Centre houses government offices and a business district. The Museum Mile represents history and cultural related pursuits, while the V & A Seafront offers shopping, leisure, and entertainment. Cape Town International Airport is just a 20-minute drive away, and there are many hotels to choose from within the city and along the coast. Getting around wouldn’t be a hassle either. Taxis are safe and reliable, and there are a bus service, a commuter rail service (Metrorail), and a luxury tourist train (Blue Train). Cape Town is a relatively compact area, wedged between Table Bay and Table Mountain. Because of its stunning backdrop, it is considered one of the most beautiful cities in the world. A drive to Cape Point would prove just that. Locals believe that if one stands at the highest spot on a clear and pleasant day, one can see the line where the Indian and Atlantic Oceans meet.